...that I completely forgot one more greyhound-related Christmas present that I received from my wonderful hubby! It's still wrapped up in it's cellophane sleeve and protective cardboard enclosure until we get a mat and frame for it, which is how I easily neglected to mention it in the last update- out of sight, out of mind! 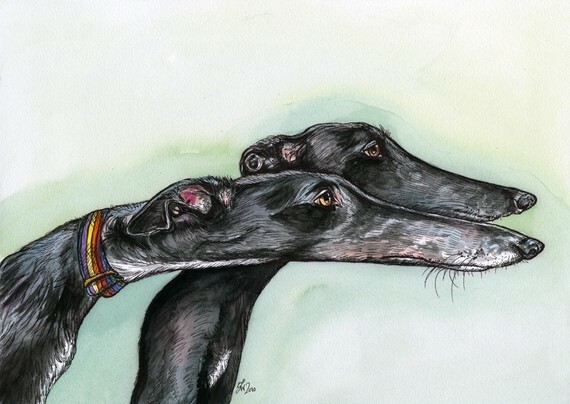 This is a print called "Eventually" by Elle J. Wilson (one of my favorite greyhound artists! ), and I think the two pups in the print have a likeness of Ana and Blue- just love it!!! Now, I just need to find a fabulous frame and mat for this 5x7" beauty and decide whether to hang it near the other print (mentioned previously in this post) or somewhere else! Love, love, love it! Definitely see the resemblance. What a cool print! LESLIE CARON & RYAN SEACREST? Are these blogs really for PEDOPHILES?